Innovus Pharmaceuticals Inc (OTCMKTS:INNV) has tripled in value since a series of positive developments that have been issued by the company. Trading volume hit an all-time record high of 1 million plus shares trading hands compared to its daily average volume of only 0.1 million shares. There are several highlights that the company has executed on in 2015 and continues to execute on in 2016. Innovus Pharmaceuticals Inc (OTCMKTS:INNV) has grown its commercial product line to include 13 products and has 3 pipeline products. It has launched its Androferti brand in the United States and filed it with Health Canada through its strategic partner, Orimed Pharma. INNV acquired Beyond Human Franchise which was completed in March of 2016. Revenues sold were over $1.3 million in 2014 and over $2.2 million in 2015. In other developments, INNV had signed eight commercial agreements with over $0.5 billion in potential revenues and additional royalties in 60 countries. It also announced that it had eliminated all of its debt by repaying its outstanding and debt that was due by raising over $2.5 million. Innovus Pharmaceuticals Inc (OTCMKTS:INNV) has aspirations of up-listing to the New York Stock Exchange to provide greater visibility and liquidity. The company continues to make significant headway in growth and progress and the CEO anticipates up-listing to occur sometime in 2016. INNV is an emerging pharmaceutical company engaged in the commercialization, licensing and development of safe and effective non-prescription medicine and consumer care products to improve men’s and women’s health and vitality and respiratory diseases. It provides innovative and uniquely presented and packaged health solutions through our over-the-counter, (“OTC”) medicines and consumer and health products, which we market directly or through commercial partners to primary care physicians, urologists, gynecologists and therapists and directly to consumers through on-line channels, retailers and wholesalers. Its business model leverages their ability to acquire and in-license commercial products that are supported by scientific and or clinical evidence, place them through our existing supply chain, retail and on-line channels to tap new markets and drive demand for such products and to establish physician relationships. It currently markets five products in the United States and signed commercial agreements in 60 countries around the world through our commercial partners. 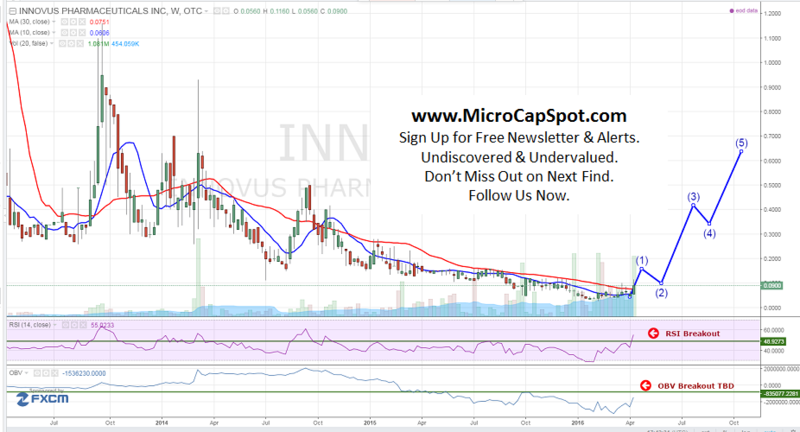 INNV is currently trading at a $10 million market valuation. The company has been executing on its core strategy and expanding its commercialized product line. It now has access to over 60 countries and hundreds of millions in potential revenue. The CEO anticipates up-listing to a greater exchange in the near future which will bode way for investors. We will be updating on INNV when more details emerge so make sure you are subscribed to Microcapspot so you know what’s going on with INNV.